The PC demo of Supreme Commander 2 is available and The Escapist has partnered up with AMD to give you a chance at winning an AMD powered system, valued at over $4,500 to bring your gaming to the next level. Supreme Commander 2 is a real-time strategy video game developed by Gas Powered Games and published by Square Enix. The story takes place twenty-five years after the conclusion of Supreme Commander: Forged Alliance, and centers on a breakdown of peaceful relations between the United Earth Federation, the Aeon Illuminate, and the Cybran Nation. The new conflict is instigated by a single bullet. 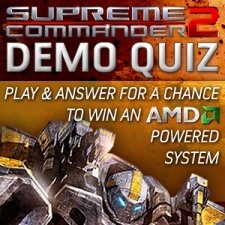 Thanks to AMD and Square Enix, we want you to download the demo of Supreme Commander 2, play the heck out of it, then answer some questions for us right here on The Escapist. For those that get all the questions correct, you are entered into a random drawing for an AMD powered system! To get started, click here and good luck. Please note: You must be at least 18 years of age and currently reside in the US to participate.